The Prince ? or Almond Mushroom ? I don't know about you but when I am out-and-about driving in the countryside after there has been several days of rain in warm weather - Spring, Summer or Fall - I have trouble keeping my eyes on the road. I am looking for those little white beacons out in the fields in every well maintained grassy area. All it takes is to spot one, like that shown below, to make my brakes squeal. It's surprising that I have never been rear-ended in all my years of mobilized foraying. What you want to find when checking out those white beacons are some pink gills underneath. 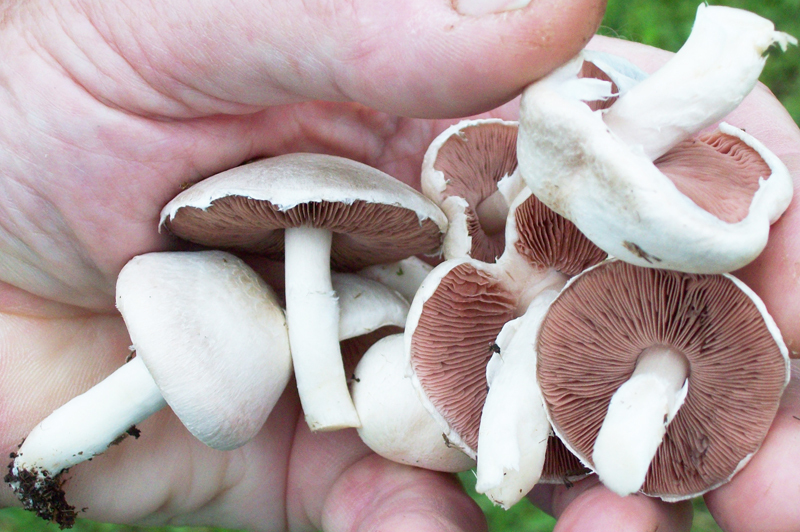 The pink gills are one of the definite requirements before proceeding further into potential picking. That's not to say that the pink gills signify a safe edible - only that it is a first step to further check into the mushrooms identification. 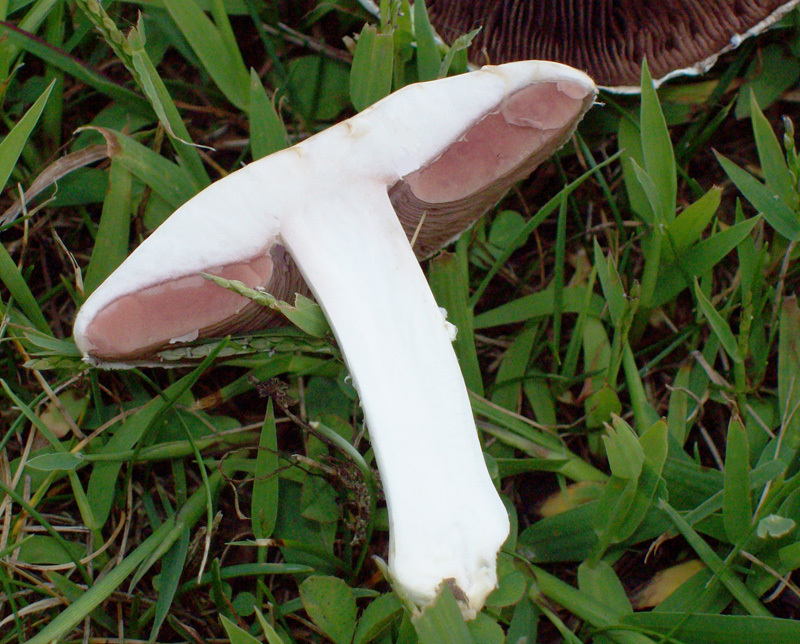 ~~~*~~~ Not all white or whitish colored mushrooms you spot out in the fields will have pink gills. ~~~*~~~ Indeed, some won't even have gills ( puffballs ). 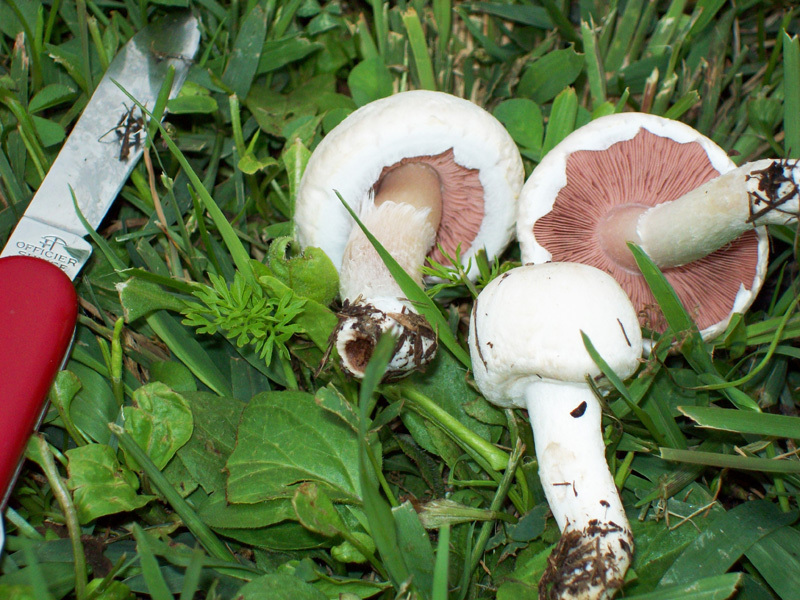 ~~~*~~~ Also, not all mushrooms found in fields that have pinkish colored gills will be safe edibles. You will occasionally stop your car with a squeal, park your car hazardously and walk a hundred yards or so and find disappointment. However, you can just as well find so many goodies that you will actually give up on the picking because your back is aching. 'Meadow Mushrooms' don't get big. Caps can get around 3 inches wide. 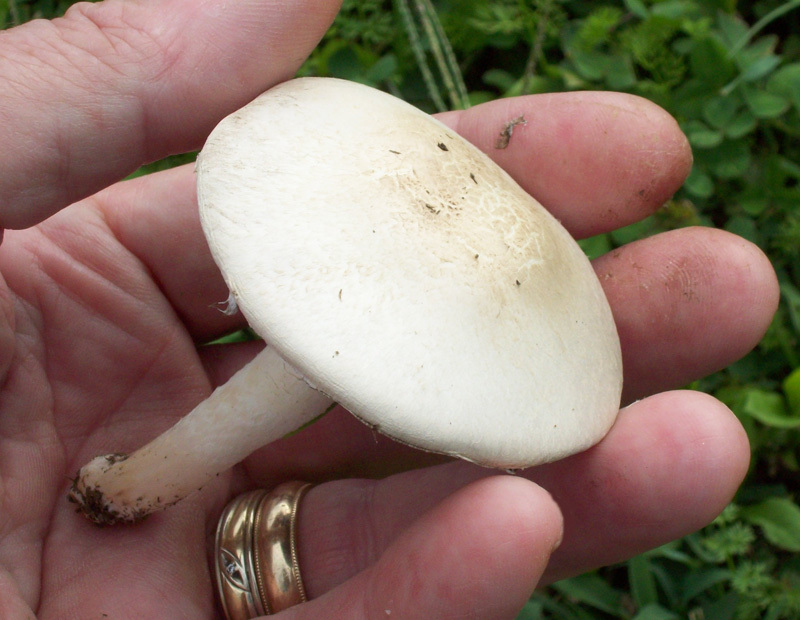 There are other varieties of edible field mushrooms that do get bigger but 'Meadow Mushrooms' don't. 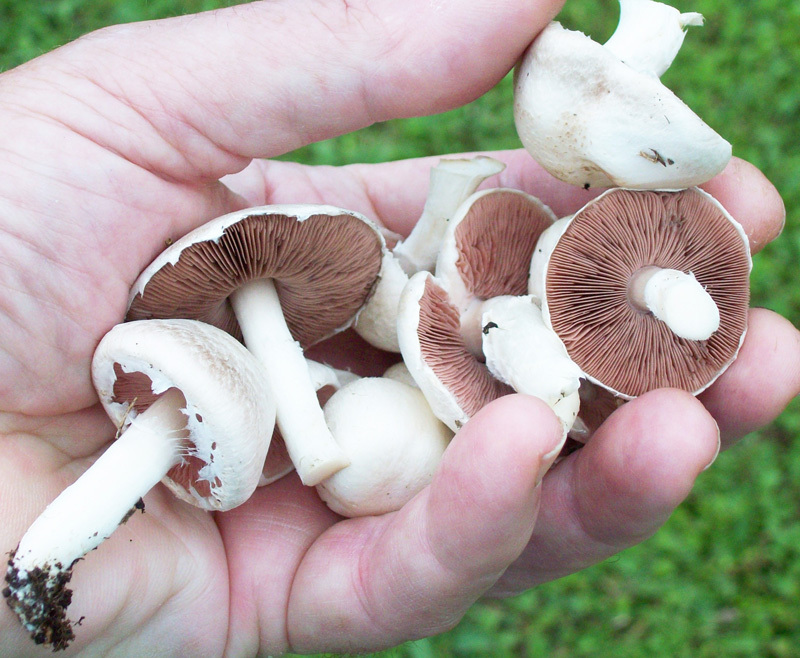 A good comparison to their overall size is to say that they are a little smaller than those white mushrooms that are sold in grocery stores. Those are first cousins to the Meadow Mushroom and because they are cultivated they have a tendency to be a bit bigger, in all stages of growth. It's synonymous to what happens with wild apples and the cultivated. Pinkies have a cap color that is white to whitish with dirty light-brown areas. Shape is convex and flattens in age. Here you can see various cap shapes. The stem will usually have an annulus ( a fragment of the veil appearing as a ring ). Some times the annulus will be absent or almost absent. It's very fragile and can be rubbed off. 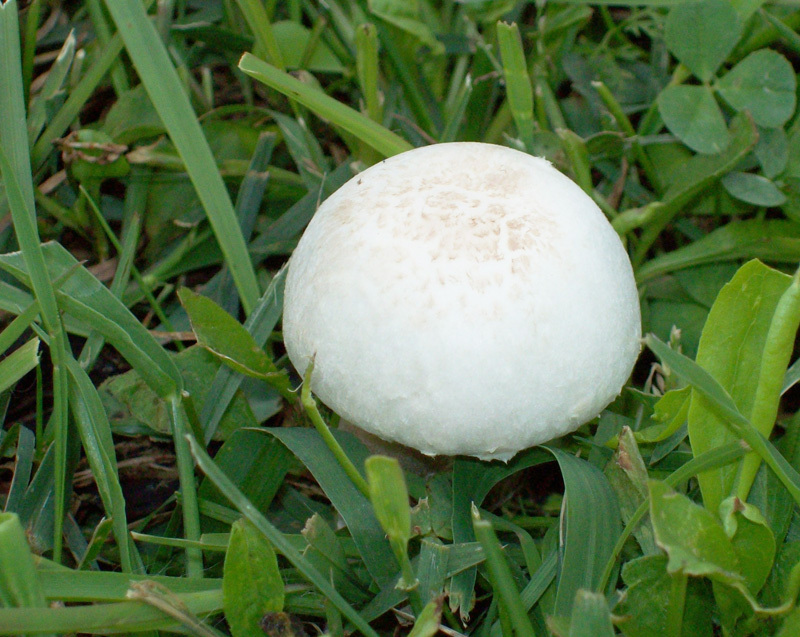 ( as long as all the other features for the Meadow Mushroom are present ). The stems are generally equal, sometimes a bit narrowed at the bottom. They will appear a bit hairy below the ring. 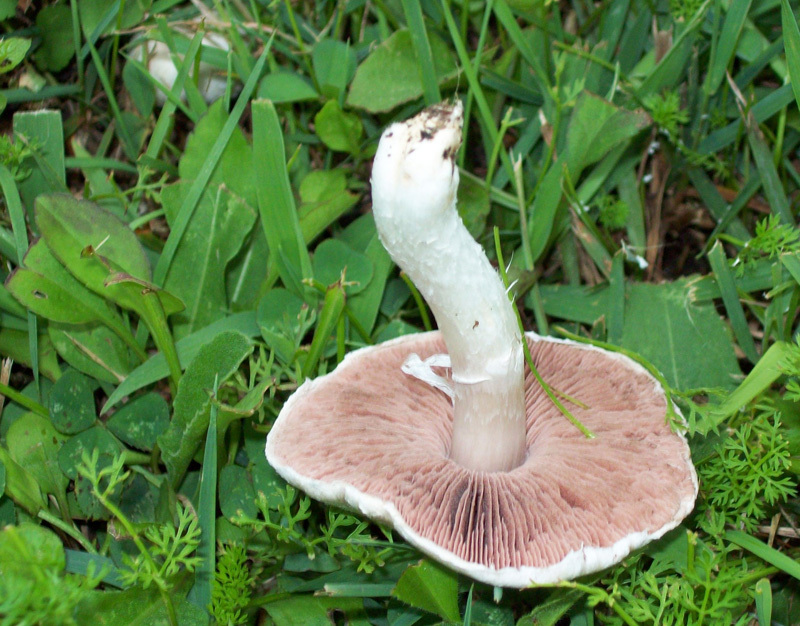 The one below is upside-down to better see the hairy ( fibrilose ) nature of the stem. 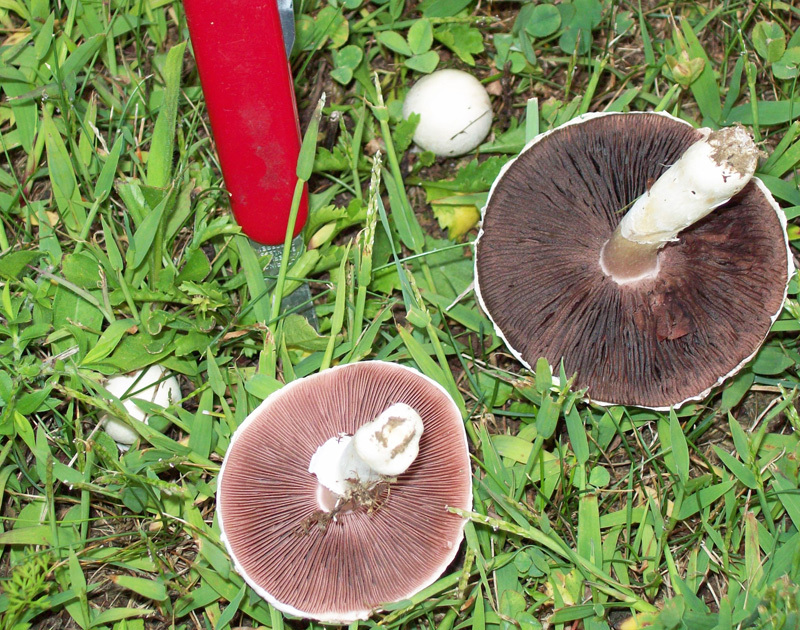 The gills are a definite pink turning chocolate brown as the mushroom matures. The gills are NOT atached to the stem. The flesh is white. Pinkish-brown where bruised or injured. It's very important that for the initial identification of these mushrooms that you take a spore print. 1. First, make absolutely sure the gills are pink when young. 2. Pull the entire stem, even the portion below the ground, to make sure there is no volva. 3. For the buttons, look for the pink. Even the little buttons, when very young ( and really delicious ) need to be checked. Open the veil a bit and look inside. B. If so, whether you can tell if they will be pink ( if you can't say for certain that they will - pitch it ). Here is a very young button stage mushroom cut right down the middle. AND that this mushroom's gills are pinkish, even at this early stage. 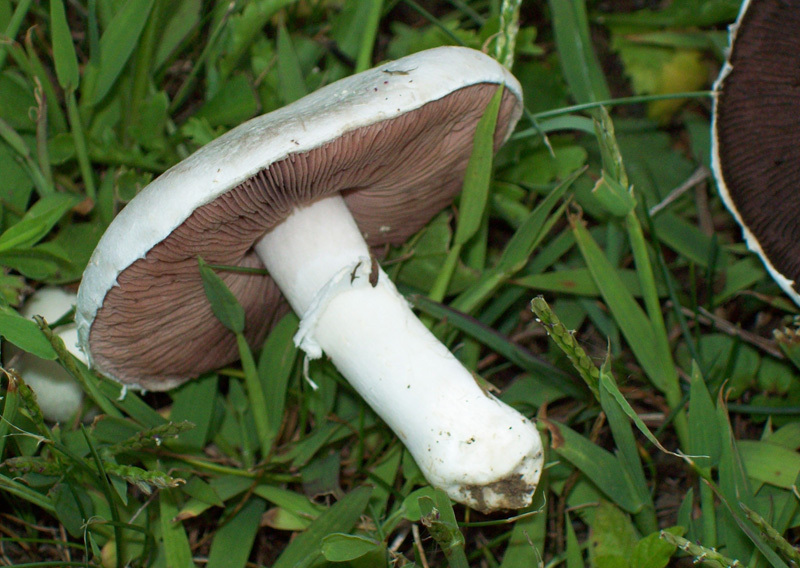 Agaricus compestris - A/K/A - Meadow Mushroom, Pinky, Pinkies, Pink Bottom. DATE - June through October. FOUND - Westmoreland County Park-Mammoth. Laurel Hill State Park, near Bakersville, Pennsylvania. Kooser State Park. Many other big open grassy areas. Weather conditions: It has been very hot and dry in 2012. However, where they have grown in the past they appeared again after a bit of wet weather.